Student Dinner Night is an opportunity for students in middle-school, high-school and post-secondary to come together and enjoy a delicious meal in community. 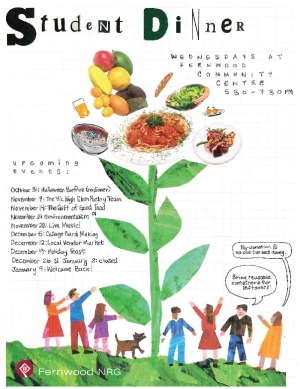 Student Dinner Night offers vegetarian and meat options every week with the hopes of bringing together youth within the neighbourhood. The meal is made from 90% reclaimed foods and is by-donation. Bring re-usable containers for take-homes. Student Dinner Night will feature a rotating schedule of activities to accompany dinner including singer-songwriter evenings, art shows, spoken word poetry nights, zine making, crafts and more. Where: Fernwood Community Centre Gymnasium, 1240 Gladstone Avenue, entrance around back! Student Dinner is currently looking for dedicated youth volunteers to help set-up, greet, serve and tear-down the dinner every Wednesday. This is a great opportunity to learn valuable skills and gain volunteer hours! We’re also hoping to collaborate with youth for the rotating schedule of activities. Would you like to help put on an art show? Are you a youth musician? Want to share your skills or talent with other people? Fill in the form below! What would you like to do at Student Dinner? If you’re interested in volunteering or being a part of Student Dinner, please contact kathryn@fernwoodnrg.ca or call 250-381-1552 ext.118.